The proposed master plan for a new park in Aloha was approved by THPRD's Board of Directors on June 13. The park is set to be constructed in 2019. At its June 13 meeting, THPRD’s Board of Directors unanimously approved the proposed master plan concept for a new neighborhood park to be constructed in Aloha in 2019. The 7.4-acre park, located at the existing Crowell Woods Natural Area, was designed by WHPacific after an extensive public outreach campaign designed to ensure that the park best serves the needs of neighbors and other park users. Outreach, which began last November, included community conversations with residents, an online survey, three design workshops, an online open house, and a May 16 neighborhood meeting to review the master plan draft. 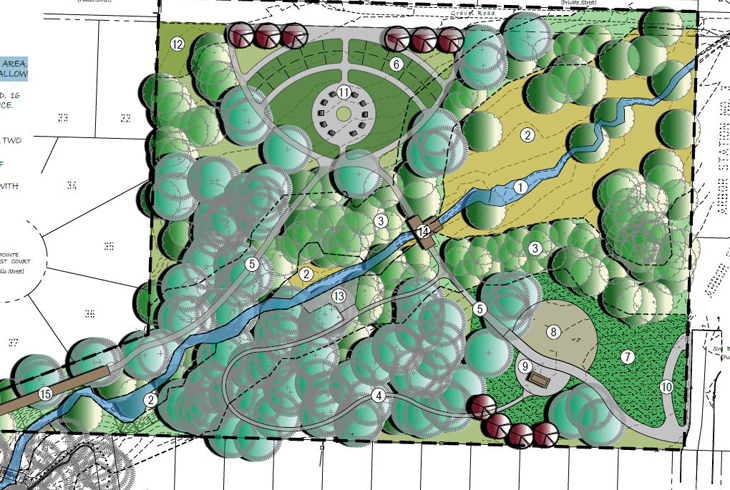 When completed, the new park at Crowell Woods will primarily serve local neighborhood needs. It expands the existing Crowell Woods Natural Area with the development of two adjacent parcels that were purchased with 2008 bond measure funds for park development and natural area preservation. The heavily wooded site, intersected by Steed Creek, includes a wetland area. A bridge over the creek will provide a wetland overlook for viewing wildlife and enjoying scenery. Connectivity: Multiple entry points will provide access to paved and soft surface trails to allow for connectivity between neighborhoods as well as looped walking paths that will guide visitors through the site’s wooded natural areas. Play area: The site will have a hybrid play area that includes both traditional and natural play elements, and an open lawn for unstructured play. Covered picnic area: Two picnic tables, adjacent to the play area, will be usable year-round. Community garden & edible landscape planting area: About 20 garden plots will allow neighbors to rent space to grow their own herbs and vegetables. Gathering circle: This feature allows informal small group seating in a natural park setting. Creek access: Along a wooded trail, visitors can explore Steed Creek at a designated access point. THPRD thanks all community members who donated their time to offer the invaluable public input that informed this master plan. We will seek your help again during park development when it’s time to give the park a permanent name. In the meantime, if you have any questions about the project, please review the document center on our project page or contact Rob Russell at 503-629-6305.